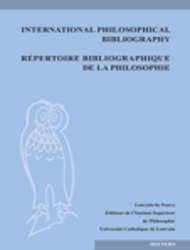 The International Philosophical Bibliography / Répertoire bibliographique de la philosophie (IPB) has been published by the Institut Supérieur de Philosophie at the Université Catholique de Louvain since 1934 and remains a crucial tool for today’s philosophical research. The bibliography is updated by specialists with privileged access to the content of many scholarly books and journals, notably through regular work with publishing houses. All the data is selected according to rigorous criteria and undergoes detailed checks to ensure it is both relevant and accurate. IPB online was launched in 1997 (IPB at Peeters Online Bibliographies). The database is updated 4 times a year and enables users to make extensive searches. Searches of commentaries on over 3,000 works, including philosophical classics (“historical works”). IPB online enables users to manage search results by saving, sorting, printing or emailing them to a particular address. The IPB retrospective contains the bibliographic records from the volume 36 (1984) up to 48 (1996). Data from previous volumes will be gradually integrated. Records are limited to bibliographic data without links or keywords.